I'm kind of liking these giveaways lately - and I hope you do, too! Today, I have a brand new Electrolux Powermix Silent Blender to give to a lucky reader - but, you have to live in Sweden for this one. Sorry! 1. What year was the Husqvarna brand introduced? 2. What is your favorite smoothie recipe? E-mail your answers to annesfood (at) gmail (dot) com and I'll make the smoothies that sound the most interesting, and pick a winner! Don't forget to include your contact details. This giveaway is open until Sunday, June 5. The brand was introduced in 1689. Vegan Blueberry Flax Smoothies are my favorite! Thanks! 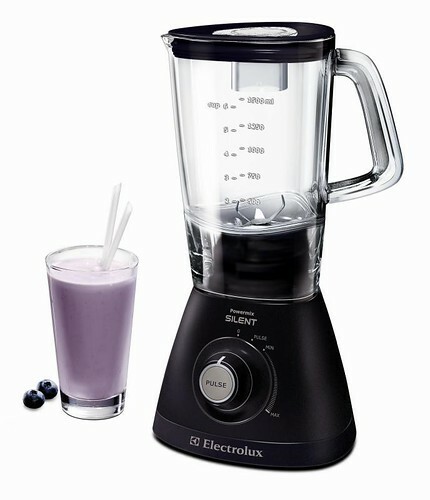 I wish I could win this beautiful electrolux mixer, so I can mixe my own smoothies.